0 Comment May 17, 2017 Like? In this video, we review how to add multiple camera sources to the NewTek Connect Pro App. This app allows users to connect IP sources, USB cameras, Capture Cards and NDI cameras into the NewTek Connect Pro App. 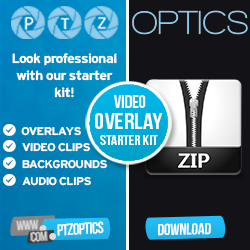 The application is now included for Free with the PTZ Producer Kits from PTZOptics. This application is perfect for viewing cameras and includes a web-server. The system integrates seamlessly with NDI compatible live streaming systems such as vMix, Wirecast, NewTek Tricasters, Livestream and more. The standard is also cross-compatible with ASPEN and SMPTE 2022. The above presentation does a great job reviewing how connect cameras to the NewTek Connect Pro App. Once connected cameras can have a full low-latency NDI connection to any NDI compatible live streaming video production system such as: vMix, Wirecast, TriCasters, Livestream and more. We review how to connect cameras via: IP Streaming, USB, Capture Cards and other NDI Sources. And in this video, I’m going to show how to use the NewTek Connect Pro App to make up to four camera sources NDI compatible. All this and more coming up next. So I have a little presentation I’d like to show to walk you through the four top ways to add cameras to the NewTek Connect Pro App. The first way is very simple. You can add a camera via a USB connection. The second way would be adding it over IP. The third way would be adding it via a capture card. And then the fourth way would be adding a source that’s already NDI compatible into the system for monitoring. So let me go to my second slide here and just show you what we’re going to be going over. The NewTek Connect Pro App is a Windows-based application used to encode, transmit, and receive high quality low latency video and audio over IP. This application makes regular video sources available to NDI compatible systems. So it can have PC — it’s a PC software for IP video hosting up to four simultaneous video sources, local and IP video sources, it supports NDI, ASPEN, SMPTE2022, and it has built-in color collection and you can have eight channels of audio. So what is NDI? In a nutshell, NDI is the NewTek’s Network Device Interface. NDI technology. It’s an open platform, open standard for live production with IP workflows over ethernet networks. NDI allows systems and devices to identify and communicate with each other and to encode, transmit, and receive high quality, low latency, frame accurate video and audio over IP in real time. This system also supports third party hardware and IO cards such as Blackmagic Design, Deltacast, AJA, and we’re actually going to show Magewell in this system working with our PTZ Producer Kits. It also has onscreen previews and a lot of really great systems that we’re going to show right now so let’s go ahead and get into it. The first thing I want to show is how to add a USB camera which is one of the easiest. So I actually got a live preview of the system here and I’m going to go ahead and transfer to that. And one of the things you’ll see here is that I basically got four channels of video here. This camera’s got some fuzz on it. I have to take a look at it. I think it’s a focus issue I’ll have to look at. But basically if we go in here, we can select between video sources. The first easiest way is actually to just pull up a camera that’s connected via USB. So I’ve already done that and that is actually this camera here. The second way is actually adding an IP camera and those actually show up if I put it actually right here. They will actually show up as a video source and you don’t even need to worry about IP addresses. So if we go to our NDI source manager here, I want to show you guys what this looks like. So this is the NewTek Connect source manager, and it allows you to actually add PTZOptics cameras to your network and make them available via NDI to the NewTek Connect Pro App. So what we’re doing here is we’re creating a config inside NewTek Connect Pro software to categorize and catalog all the PTZOptics cameras on our network. You can put a little memo which I would suggest putting the IP address and the location of the camera just so you could keep everything straight. It’s a nice little management tool that allows us to expand our IP base workflow with the NewTek Connect Pro App. And you can see in here I’m putting in the IP addresses and the port number; and then the username and password is admin, admin. So if you want to add a new camera, there’s a dropdown and you can just select “PTZOptics.” Type in the name of your camera that can be unique to the location or however you want and again there’s that memo section. And basically, your PC becomes a hub which can host up to four simultaneous video sources for use in your live video productions. Video sources can be any combination of format or standard so that you can have signals coming from a local webcam, IP cameras like we’re showing here, baseband video, stored media playback, and other IP sources whether it’s NDI, ASPEN, SMPTE2020 standard. So all these video sources can be color corrected and you can have up to eight channels of audio as well. So it really allows you to configure a host computer to be a multichannel video system to create that IP workflow. So that was the demonstration of how to get the IP cameras in. Now, let’s look at the next one which will be adding basically a — this is the demo here of adding another camera source which will be this one we already have in here is the 20X-SDI and that’s an IP source. I just wanted to show all of those cameras we just configured are now available as local sources to the NewTek Connect Pro App so that we can make them NDI compatible. We can also choose a channel name, and what that does is that is the channel of NDI that’s going to be available on your network. So I’d highly recommend creating that name, something that you’ll want to see in your larger video production switcher like a TriCaster or vMix or WireCast or Live Stream Now. That was the color correction really quickly and then I’ll show you one more here. Now we’ll go ahead and add another video source. We had a piece of media there but what’s even easier is the ability to add an additional camera here. What we’ll do is we’ll go ahead and add the 20X-SDI there, so that’s another IP source. So that’s just a few sources. We also have a capture card here. I have a Magewell frame grabber here. You can see it’s going HDMI in and USB 3.0 out. Now, we can also take HD-SDI in and take USB 3.0 out. So that’s a direct video connection to the system here and it will show up directly in the source manager of the NewTek Connect Pro App which will allow us to again take that media and go ahead and make it NDI compatible. So let me just finish my presentation here. So we showed all the different sources and let’s just go to the next slide here. You can see that the USB camera, super easy, just plug and play USB 2.0 or USB 3.0. That’s super easy, we showed that. HD-SDI or HDMI, that was that frame grabber we talked about, instantly recognizable. The next source is the IP camera where we were looking at that IP config section which was fairly straightforward. And then once that’s all set up, all of those sources are available in the NewTek Connect Pro and we can make four of those cameras NDI compatible. That’s how we configured it. We showed all of that. And then adding an existing NDI source, that’s our last example here, and I’ll go ahead and show you how that can be done. If you go ahead to that source there, actually it’s the number 8 there. You can see that — I’m sorry. It is number 6. There we go. This is actually the ability to take — I have a vMix system just for testing here and this is the output of this system. So any NDI source is also available here as well. So the reason why we might want to do that is that if — for monitoring purposes. And then the final thing I’ll mention before we — that is our four ways to bring in camera sources. Any camera that’s connected to a TriCaster or any supporting NDI system, whether it’s vMix, WireCast, Live Stream, and there’s even more out there, or whether it’s in any NDI converter box, that will also be able to be seen in the NewTek Connect Pro App. So I hope that this has been helpful. This NewTek Connect Pro App is now available inside of the PTZ Producer Kits for free. It allows you to have an IP workflow and attach to so many applications and workflows. So hopefully this has been a helpful video for you. Don’t forget to like and subscribe to our video, and thank you so much for taking the time to watch.